Champagne and Socks » First Finished Object! Alisa Krasnostein is World Fantasy Award winning editor and publisher at Twelfth Planet Press and part of the Galactic Suburbia Podcast Team. She was Executive Editor of the review website Aussie Specfic in Focus!. Currently working on a PhD in Publishing, in her spare time she is a critic, reader, reviewer, runner, environmentalist, knitter, quilter and puppy lover. She is a fulltime Mum. December 30 First Finished Object! I’m going to track all the things I complete this year (did you notice yet that I’m cheating and making 2015 13 months?) for easy reference. It’ll serve as a contradiction to the “I never get anything done/finished” mantra. Feeling productive, and being productive, it seems, are two different things. Here is the very first finished knitted object – Izzie Cloche hat in Zen Gardens Serenity which was the first project for my KnitCrate subscription. KnitCrate is a very cool knitting/crochet subscription service. You can sign up for about 6 or 7 different options. They used to have a baby crate when I signed up so I initially subscribed to the indie crate with add ons of the baby crate and the mini skeins (add ons allowed you to get the yarn and pattern for a second or third crate for a lower additional cost to your main subscription). Earlier this year they dropped the baby crate and I moved to an int/advanced crate but I hear they’ve since dropped the option of add ons (except maybe sock and mini skein). As well as the yarn and pattern, you also get a cool knitting extra (like a stitch counter or needles holder) and a sweets extra (cool things like hot chocolate or biscuits etc). My deal with myself was that KnitCrate was not going to be a stashing exercise. I had to knit the projects as they came in and in that way, I would be knitting along with Deb, whom I’d coordinated to subscribe on the same bimonthly schedule. 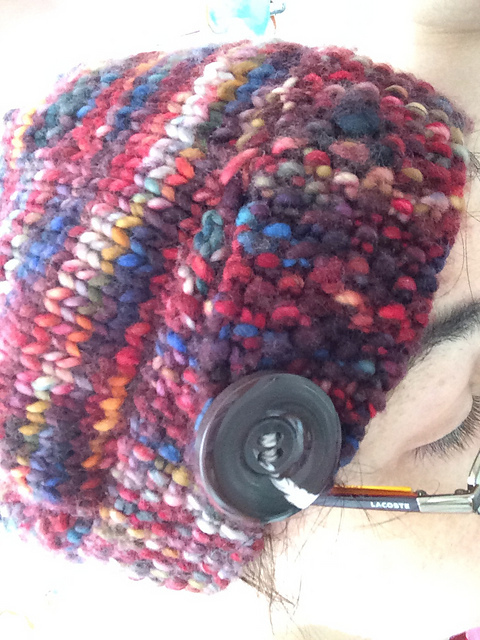 I knitted this cloche at the same time as Deb and um, I totally just never actually sewed the button on so it could be considered “finished”, and, you know, worn. I’m not a hat person so after this photo, it went on the hat rack but hey, I might get to a World Fantasy Con again and need a hat. If you care about pattern details, I’m attempting to be better at keeping my Ravelry projects current – come find me there as “girliejones”. It was a quick and easy knit. And I like the yarn and the finished project. I think I ended up with close to one full ball of yarn leftover that did get added to my stash. And that’s one knitting WIP done and finished. May the tally roll. Design by: Bingo - The Web Design Experts.